I feel a lot better after a good nights rest. After breakfast Dawid gives me a ride to the airport to check my luggage. The bad news is that it did not arrive. The good news is it has been traced in Cairo. It will be transfered to Asmara with tonight's EgyptAir flight. So we have to come back tomorrow to collect it. I make notes of the name and the telephone number of the person responsible, so we can call him tomorrow morning, to prevent more waist of fuel and time. At the Edaga Hamus bus terminal I remember I visited a small restaurant called Naser Omer where I had nice food for a fair price. The owner, Tecle Zerai, remembers me from my October 2014 visit and he is so happy I did not forget his restaurant. He joins my table to have a short chat. He wants to know how I found his restaurant. I tell him I did not forget the outer decorations on the facade of the restaurant. I order the frittata (egg, potatoes, tomato and onion) and my favorite fruit juice. The fruit juice is not available, so I chose the coke. No coke either, so I choose tea. "You realy want Coca Cola?" the Tecle asks. He is out to find me a coke. A few minutes later he is back with a cold Coca Cola. 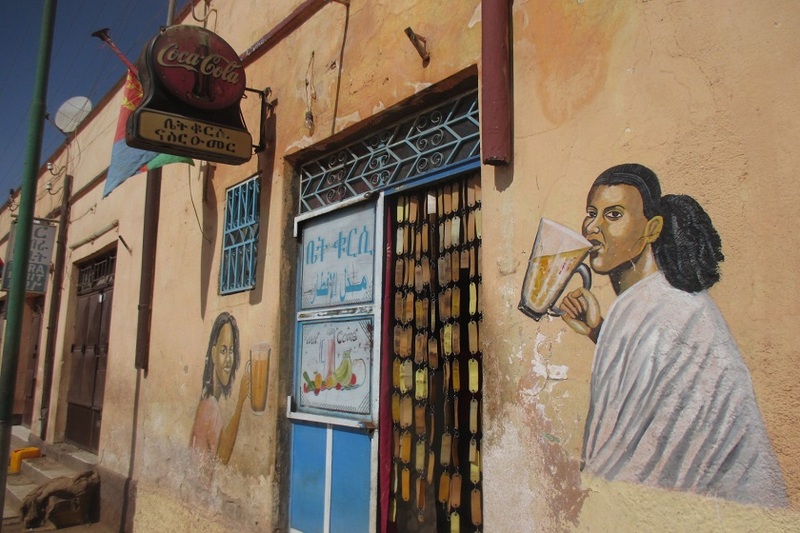 Hospitality a la Eritrea. I compliment the cook in Tigrinya (tu'um, tu'um, tu'um). Tecle communicates my compliments to the kitchen. He even calls his brother Mehari, so he can be the interpreter with his better knowledge of the English language. 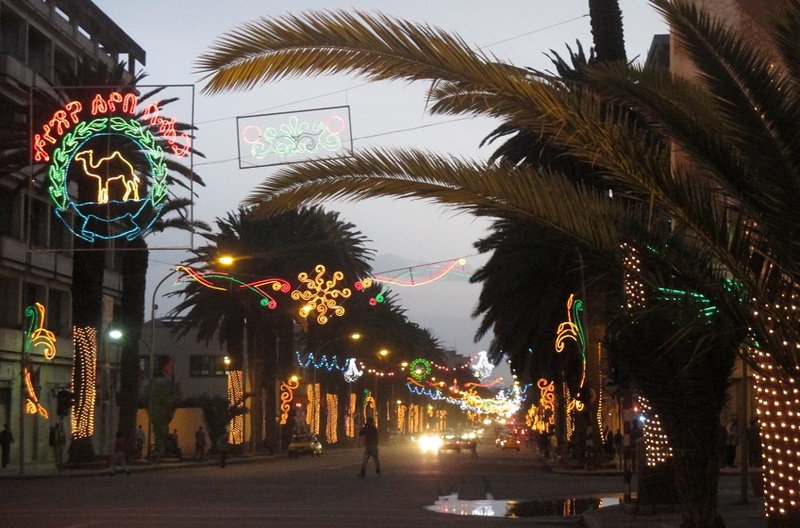 We chat about Eritrea, about The Netherlands, and about Independence Day. When I leave and want to pay the bill, I miss the charge for the coke. I tell the casher I had a coke as well. "You are our guest today" Tecle explains. The coke is a gift. It wettens my eyes. It should be me to hand out the gifts as a rich tourist, and not these poor people working hard for their income. I promise Tecle I will come back when I am around. At the Edaga Hamus bus terminal I buy half a dozen of fresh lemons for 10 Nakfa. They will be good for my stomach as a pre breakfast drink. In a shop I buy banana's. 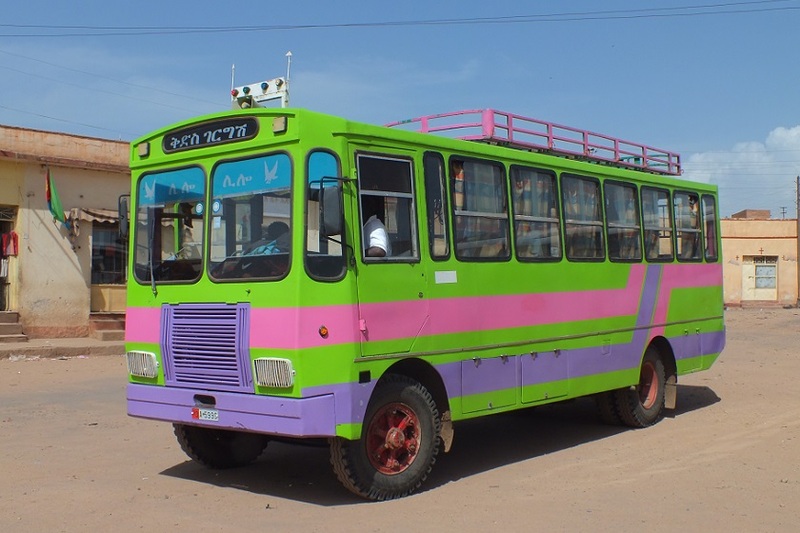 At the terminal of the Massawa buses I watch the modern fleet of Harat Transport Company. 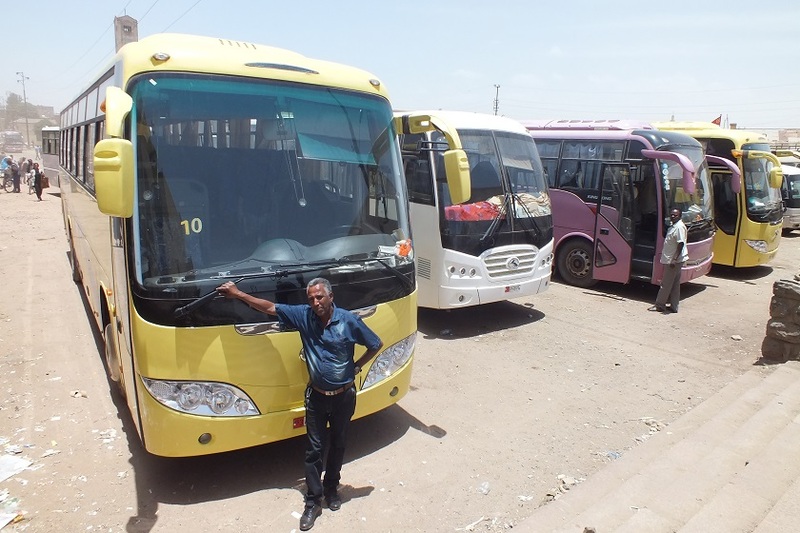 Many brand new King Long and TATA buses enter and leave the bus station servicing the Asmara - Massawa and Asmara - Assab public transport. In a snack bar next to the bus terminal for the Massawa buses I have an other coke for the further elimination of the Egypt bacteria. Three boys selling various merchandise at the bus station enter the snack bar for some water. Their small income does not allow the luxury of a coke. I order three extra coke's for them. They are very happy with the small gift. And so am I. I am the one that should hand out the gifts. I think they deserve the gesture. They do not beg for their money, but work hard to earn it. I leave the bar to stroll up and down the bus terminal to picture the new and old timer buses, having a chat with the drivers and the passengers, sharing memories and the banana's I bought in a nearby shop. I now feel strong enough to walk the three kilometers to Edaga Arbi to visit Tabotu, Hadgembes, Tirhas and Selam and their kids. I apologize for not bringing any gifts. They are still in Cairo. But I will be back. Hadgembes makes a phone call to Fessehaye. Fessehaye is the husband of one of my wife's girl friends, Tirhas. 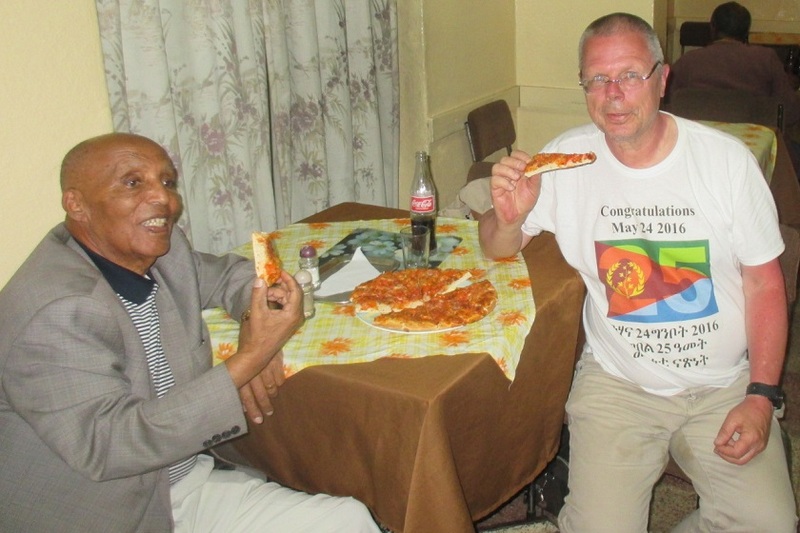 Fessehaye invites me to have a pizza at their pizza restaurant Pizzeria Eritrea. Fessehaye has a second surprise for me: more than ten invitations for various performances in Cinema Asmara and Cinema Roma for May 17, 18, 19, 20 and 21. Even I can choose, as the performances are simultaneous in the two cinema's. Fessehaye translates the Tigrinya text, so I can make a choice and I will know where to go. There is an invitation for this evening as well, but I am too late to go. At 19h30 I return to the house making pictures of the beautiful illuminated Harnet Avenue when suddenly power is down and it is completely dark. Generators are switched on and after a few minutes most of the bars and restaurants are back in business. Booming business when the streets are dank and the bars are illuminated. Back in the house Zibiba, the maid, has connected the emergency lights, so we do not have to sit in the dark. 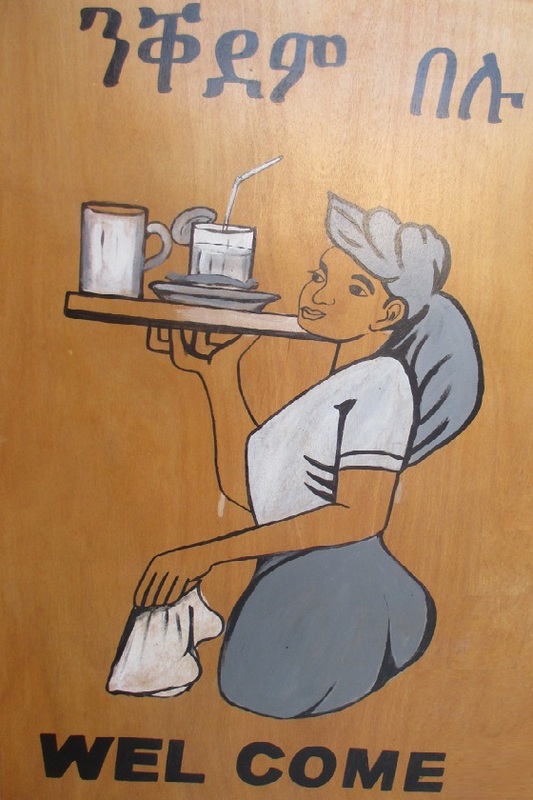 She makes me tea with hembesha (Eritrean bread). I add one of the lemons as a natural medicine. I spend the evening with Dawid and Shawit chatting about today's experiences and my next days plans. Golden Hotel - Edaga Hamus Asmara Eritrea. Edaga Hamus bus terminal - Edaga Hamus Asmara Eritrea. 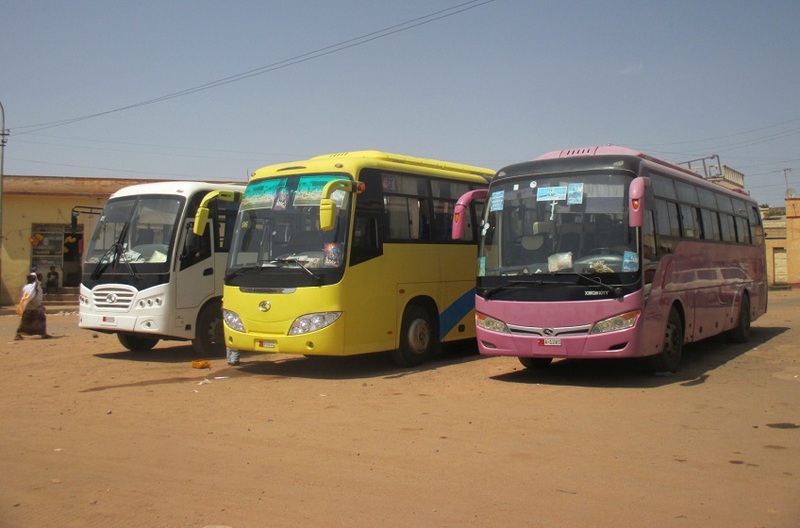 King Long buses - Edaga Hamus bus terminal Asmara Eritrea. 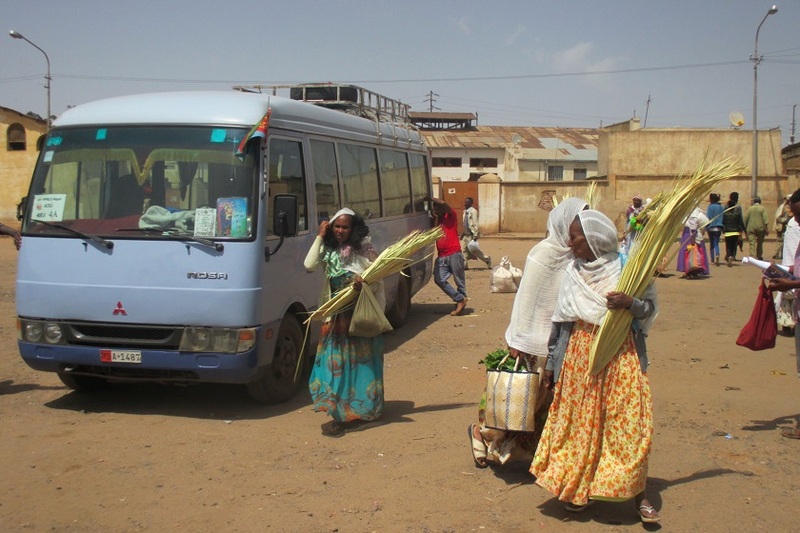 Private bus - Edaga Hamus bus terminal Asmara Eritrea. 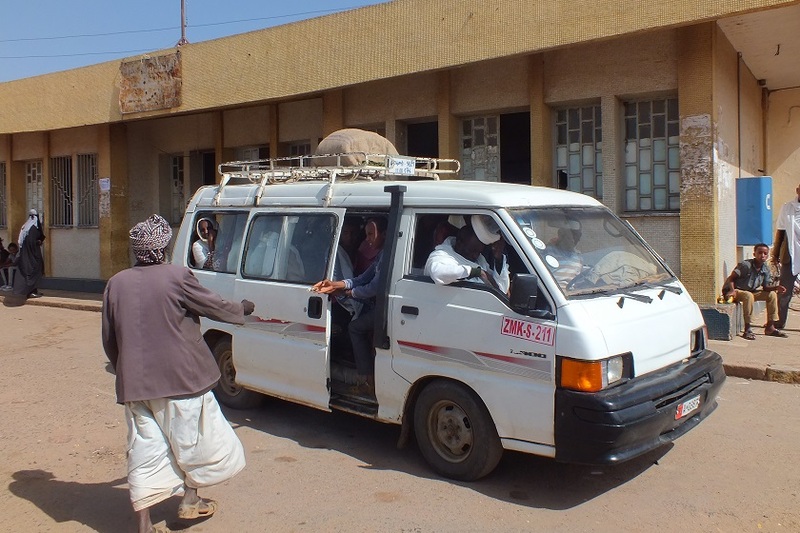 Private mini bus - Edaga Hamus bus terminal Asmara Eritrea. 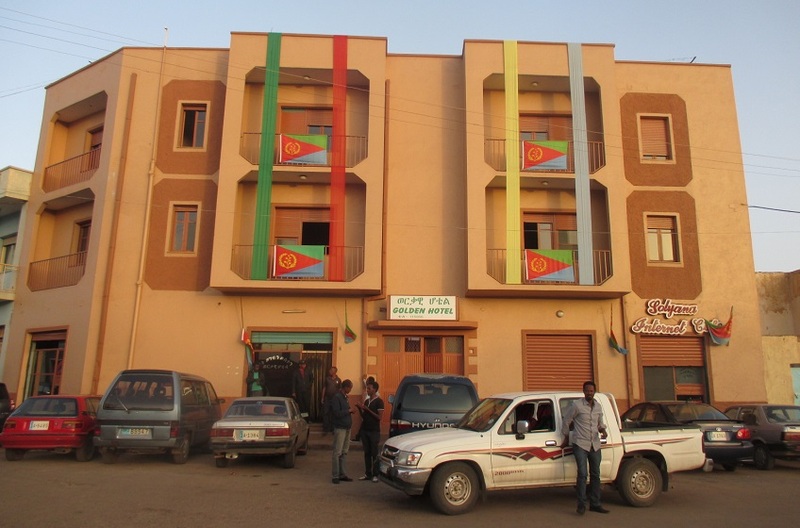 Restaurant Omer Naser - Edaga Hamus Asmara Eritrea. 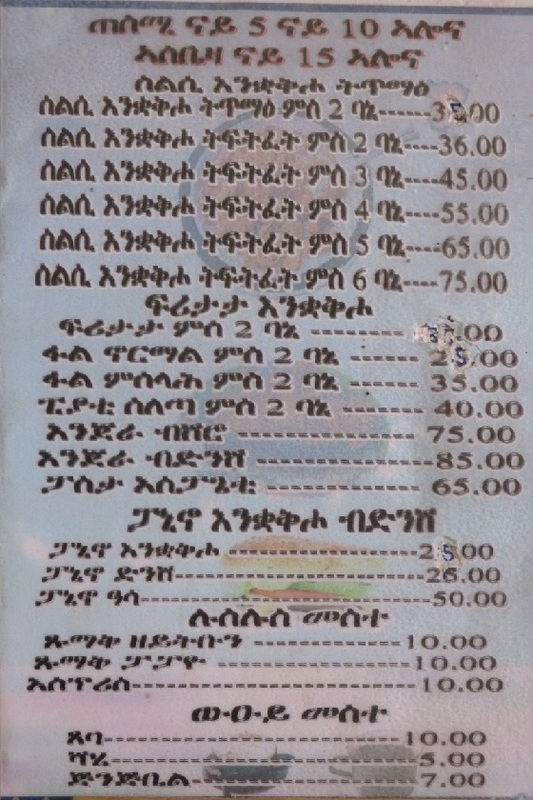 Restaurant Omer Naser menu - Edaga Hamus Asmara Eritrea. 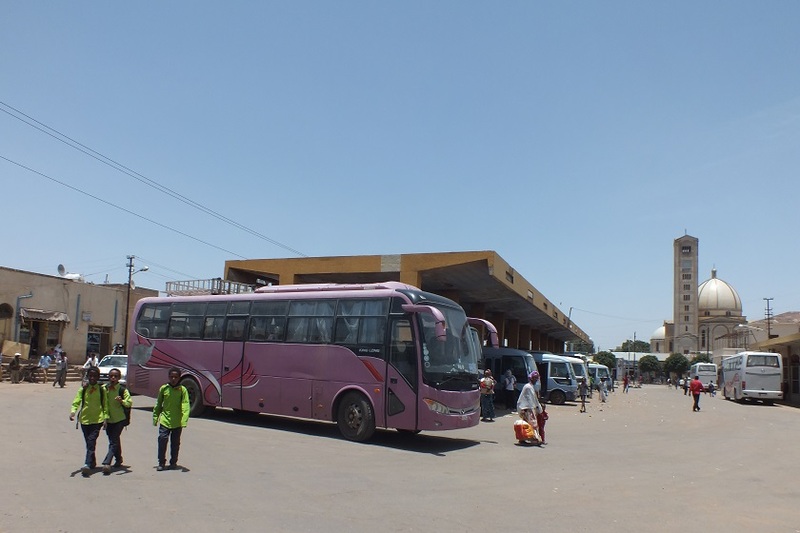 Harat intercity buses (Massawa bus terminal) - Asmara Eritrea. 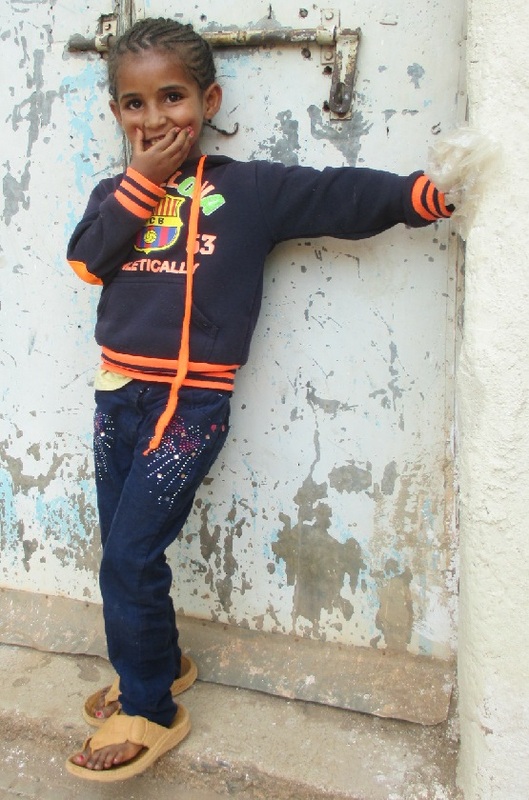 Kids selling soap - Bar at Massawa bus terminal - Asmara Eritrea. Selam and Tirhas and their babies - Edaga Arbi Asmara Eritrea. 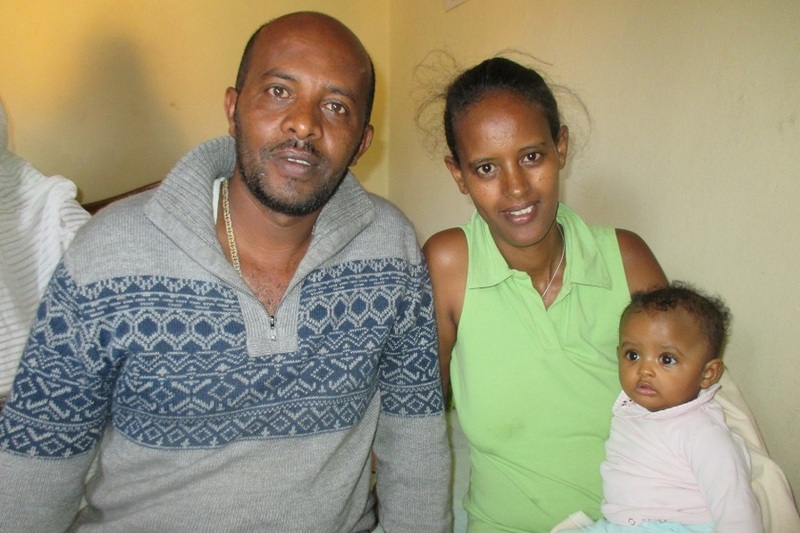 Hadgembes and Tirhas and their baby - Edaga Arbi Asmara Eritrea. Salena! 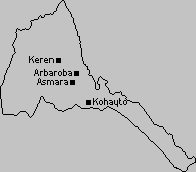 - Edaga Arbi Asmara Eritrea. 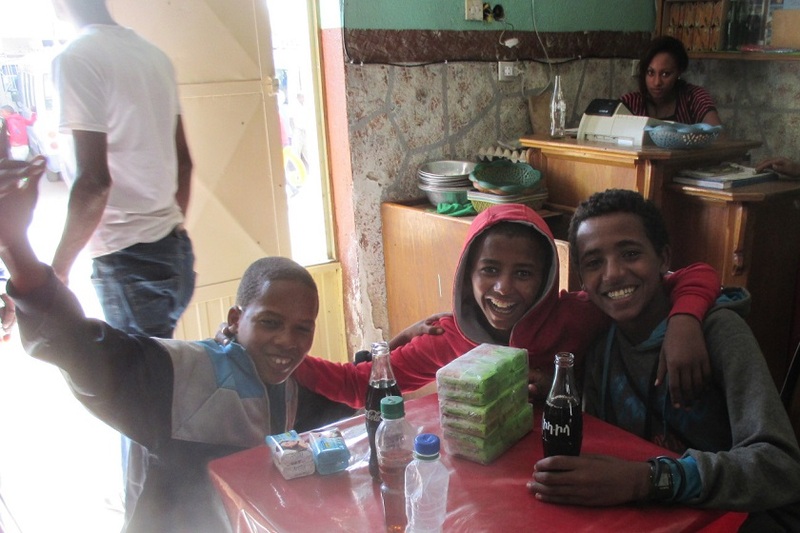 Fikri Snack Bar - Edaga Arbi Asmara Eritrea. 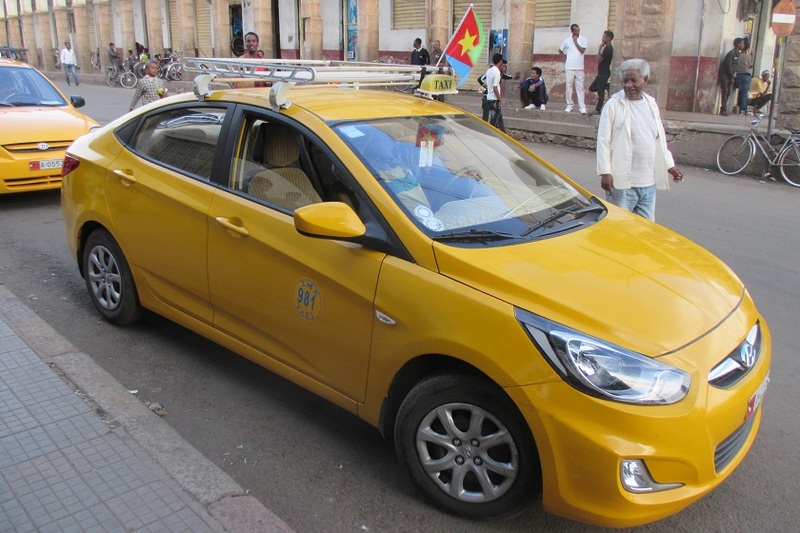 Taxi - Eritrea Square Asmara Eritrea. Fessehaye and Hans - Pizzeria Eritrea Asmara Eritrea.